Good chocolate sorbet tastes like a slurry of frozen, bittersweet truffles. Without the milk fats that lend ice cream it’s heft, this sorbet is uninhibited, creamy, absurdly rich and pure…just like I’d imagine that chocolate waterfall at Willy Wonka’s factory would taste. I was inspired to make this recipe after I bought a pint of Double Rainbow Chocolate Sorbet at the corner store. It was an impulse purchase for a quick and dirty sugar fix. The sorbet was sticky sweet with cane sugar and corn syrup, but I ate a big scoop anyway. The best part was what went on top – a handful of roasted peanuts, tart dried cherries and a sprinkle of Maldon sea salt. The toppings tasted so good, I was determined to find a chocolate sorbet that could live up to them and hold its own. Enter the one and only David Leibovitz. I discovered his recipe on Food52, pulled from The Perfect Scoop, his 2007 homage to our favorite frozen delights. It’s a surefire dessert dazzler. And, wait for it…the news just gets sweeter. I’ve discovered, through trial and error (or just falling asleep while the sorbet was chilling in the freezer, pre-ice cream maker spin) that this recipe doesn’t necessarily require an ice cream maker after all. So, if you don’t have one, forge ahead anyway! This recipe is remarkably resilient, perfectly scoopable and free of icy bits. When it comes to the sundae toppings, feel free to craft your own creations. I do highly recommend the subtle crunch and contrast of the sea salt and peanuts. The cherries lend a welcome tartness, but swapping them out for fresh raspberries or strawberries would be undoubtedly divine. 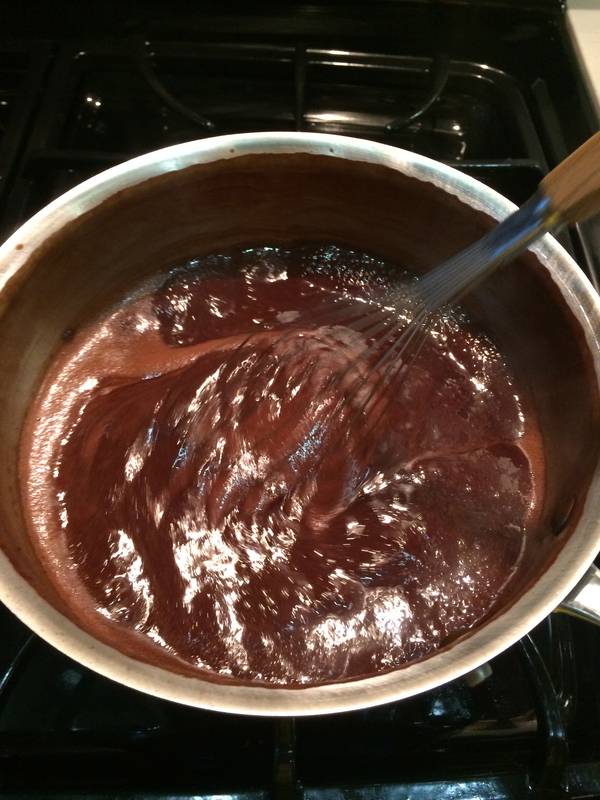 In a large saucepan, whisk together 1 1/2 cups of the water with the sugar, cocoa powder, and salt. Bring to a boil whisking frequently. Let it boil, continuing to whisk for 45 seconds. Scoop into bowls, shower with your favorite toppings and serve with big spoons.